Selling to China is an engaging, authoritative guide that provides many useful tips for building a business in China that can last. When it comes to selling products in modern China, sometimes what a company thinks it knows, based on outdated information or strategies, can be a sure recipe for failure. 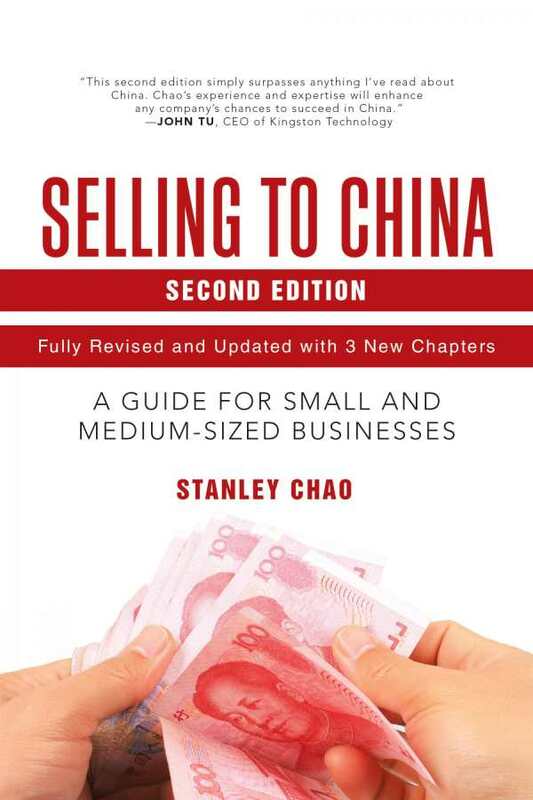 Stanley Chao’s Selling to China is targeted at small foreign companies looking to break into the Chinese market, but is a welcome resource for any businessperson who wants to understand what doing business with China is like, in the here and now. The American-raised Chao has decades of experience as a consultant helping entrepreneurs and small businesses find success in China, and this new edition of his 2012 book includes plenty of practical advice. Taking a hatchet to misconceptions about Chinese cultural mores, and offering strong warnings about potential pitfalls when dealing with local companies and distributors, Chao organizes Selling to China into digestible, succinct chapters. All the important aspects of doing business in the Middle Kingdom are covered, from choosing a translator wisely to the ins and outs of contracts and building an effective business plan. In the book’s most fascinating passages, Chao breaks down how the hard lessons Chinese citizens learned during the Cultural Revolution colored their business practices, but also looks ahead to a future in which younger Chinese generations will have more in common with their Western business counterparts. Throughout, Chao backs up his points with numerous anecdotes about companies he’s worked with as a consultant. He’s honest about discussing his failures as well as his successes; for every profitable venture, there are plenty of horror stories of companies that had their ideas stolen from under their noses, or became mired in litigation, or were even bankrupted by their involvement with China. These case studies only strengthen the authenticity of the book and give weight to the common-sense prescriptions it offers. Doing business in China is not for the fainthearted, Chao notes, but he also presents a compelling argument for why the time to get into Chinese markets is now, with an updated chapter that features his predictions on how the nation will progress in major fields such as aviation, biotech, and entertainment. Additional chapters include a new section on online selling in China and an amusing rundown of Chinese stock phrases and what they really mean in the business context. As Chao himself admits, things are always changing in China, and what’s in vogue (or even legal) today might be different within months or weeks. Nonetheless, whether you consider yourself “an old China hand” or are a new company looking to make inroads in one of the most populous markets in the world, Selling to China is an engaging, authoritative guide that provides many useful tips for building a business in China that can last.